Hi everyone, I hope you all had a lovely Easter! We had a great day celebrating with family. 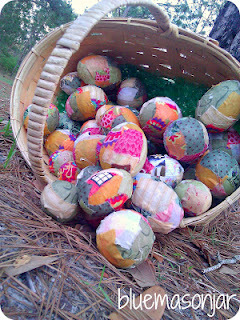 This week's featured link is: Egg~Scrap~Tic from the The Blue Mason Jar. Such a fun project. She has a great blog and lots of creative ideas on posted. Go check her out. Thanks for hosting a lovely party. Can't wait to see what everyone links up!! Thanks for hosting....have a great week! Hi Sandy :)) Stopping by the hop through Holly's blog! I'm your newest follower through GFC and LF. Hope you can stop by my blog and return the ♥!